DETROIT -- Ford Motor Co. is readying its first global marketing launch of a mass-market car, the redone Focus, which will be unveiled next month at the Detroit auto show. 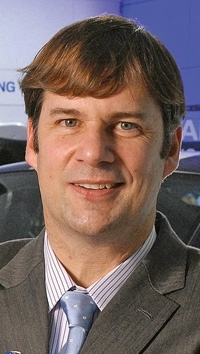 Rather than the dozens of different ad campaigns Ford used globally when the first Focus arrived in 1999 as a 2000 model, the automaker will use the same executions, whether for TV, online or events, Jim Farley, group vice president of global marketing and communications, told Advertising Age. For the marketing equivalent of the automaker's "One Ford" program, he mustered his troops around the world this year, along with staff from its advertising agencies, which are part of WPP. "We really have changed the approach on how we work together as global and regional marketing teams and public relations in the way we will go to market and take waste out of the system," he said. In the past, Ford's marketing leaders for North America, Europe and Asia did not collaborate on how many websites to use for a model launch, how to unify public relations efforts, or how to best use auto shows in the pre-launch phase, Farley said. Also on the team to unify the message -- and reporting directly to Farley -- is Elena Ford, the great-great granddaughter of company founder Henry Ford. She was named early this year to the new post of director in charge of global sales, marketing and service operations. Unified global ad campaigns in the car market aren't that unique. But most of those tried sporadically over the past 15 years were for niche brands such as Saab and Jaguar. Farley's efforts mirror what Ford is doing on the product side. Under that effort, dubbed "One Ford," the automaker shifted to create a single worldwide DNA for all Ford vehicles to simplify product development and purchasing. The first version of the Focus made in the United States differed greatly from its sibling in Europe. Now Ford will produce the same Focus-based cars in Europe and Asia, giving the company global economies of scale. The 2011 Focus is expected to go on sale in fall 2010 around the world. The car's pre-launch activities will start the day it debuts to reporters at the North American International Auto Show in Detroit. Although Farley declined to reveal those plans, one only need examine the extensive use of social media and experiential events he and his team used to generate buzz and awareness this year for the upcoming Ford Fiesta, due to arrive in U.S. dealerships in mid-2010. WPP's Team Detroit handles Ford, Lincoln and Mercury strategy, creative and media in the United States. Ford tapped 100 young, American "agents" to drive the Fiesta for six months starting in May and used social media to get the word out. The marketer also conducted ride-and-drive events in 300 cities over the period. Farley said as a result of the combined efforts, name awareness for the Fiesta is similar to what the Ford Edge and Flex have after two years of traditional advertising. The second phase of Fiesta's pre-launch started this month. Ford is taking video applications online through January at fiestamovement.com for 20 new teams of agents. In 2009, Ford set aside 40 percent of its ad budget for digital and experiential marketing, Farley said at a recent auto conference organized by consultant J.D. Power and Associates. TV is the medium still getting the biggest share, with 50 percent, and print gets 10 percent. Ford ranked as the world's eighth-biggest ad spender in 2008, with global measured media spending of $2.45 billion, according to Ad Age's most recent Global Marketer report. Ford is expanding its U.S. test-drive programs, such as the one for consumers at the Los Angeles auto show last month. "We have invested heavily into events in our auto shows," Farley said. "Our idea is to advocate customers who come to the shows and approach it like a hands-on museum."